André Calero Valdez is Senior Researcher at the Chair of Communication Science and Human-Computer Interaction Center at RWTH Aachen University. He studied computer science at RWTH Aachen University, specializing in software engineering and psychology. Due to his excellent degree, he was awarded a doctoral scholarship by the RWTH Aachen University. 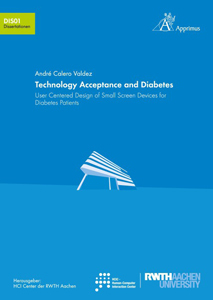 In his dissertation, André dealt with user-centered development and evaluation of a small-screen device for diabetes patients. Since 2013, André has been working as a post-doctoral fellow at RWTH Aachen University and deals with the interface between algorithms and humans in different application areas. He works in the fields of empirical social research, technology acceptance, eHeatlh, industry 4.0, recommendation systems, information visualization and social media. Since 2014 André is visiting professor at the Medical University Graz at the HCI-KDD Group with Prof. Dr. Andreas Holzinger, where his research focuses on the integration of computerized methods and machine learning in health care. Since 2018 André is the research group leader of the junior research group “Digitale Mündigkeit”. In this research group, the interaction of recommendation algorithms, social bots, and fake news in social media are investigated. Against the background of a digitalizing industry (industry 4.0) the question of how companies and future staff are prepared for these changes is becoming increasingly important. That is why the focus of this empirical-experimental study was put on the investigation of the choice of job of Millennials and their requirements on the ideal workplace. The perspective of high potentials within the group of Millennials was collected by means of two focus groups (n=8) which were carried out prior to the main study, a quantitative conjoint study (n = 165). By applying conjoint analysis, the study empirically investigated the relationship between the attributes job tasks, flexibility, family-friendliness, and salary. With digitization of production technology changes in technology infrastructure will become more frequent and more important for the competitiveness of organizations. Here, a crucial factor lies in the acceptance of such novel technology by users. Technology acceptance models aim to predict the adoption of new technology in an organization. They are however static in nature and fail to capture to dynamic process of adoption. To overcome this limitation, we utilize quantitative data from a small organization to understand both acceptance patterns and social structure of the organization. Both are used in an agent-based simulation to predict acceptance integrating social effects of diffusion over time. Our simulation achieves very similar results as the quantitative real-world data. Democracies in the late 2010s are threatened by political movements from the borders of the political spectrum. Right-wing populist parties increasingly find agreement in larger parts of the population. How are these people convinced to these political beliefs? One explanation can be seen in polarization and the phenomena that arise from it such as the spiral of silence. In this article we empirically investigate how digital media usage influences the perception of polarization in Germany using a survey with 179 respondents. We use polarized opinions and mea- sure agreement from two perspectives with them. We find an influence of social media usage on the perception of polarization in our sample. Further, polarization seems to be perceived differently depending on the topic. The results contribute to an understanding of how to adequately design presentation of sensitive or controversial topics in digital social media and could be utilized in student eduction to sensitize social media users to the effect of polarization of opinions. The filter bubble theory, popularized by Eli Pariser in 2011 is subject of academic discussion. With political polarization seemingly increasing, this issue increases in relevance. As recommender algorithms in news-related data bases or search engines such as Google are often intransparent, the project Datenspende: BTW17 aimed at providing data from the users point of view. Google search results for the major German political parties and their leaders of over 1000 participants were collected in order to make sophisticated analyses possible. Based on the data provided, we conducted exploratory tests to investigate how search results of different users differed. As we deemed the order of the search results relevant as well, we compared how the first three, six and nine results were different respectively. We found that differences were the strongest for the first three results, with large differences between the search terms as well, indicating that for some queries filter bubbles could exist. Research on spatio-temporal visualization is driven by the develop- ment of novel visualization and data aggregation techniques. Yet, only little research is conducted on the systematic evaluation of such visualizations. Evaluation of such technology is often conducted in real-life settings and thus lacks fundamental requirements for laboratory-based replication. Replication requires other researchers to independently conduct their own experiments to verify your re- sults. In this position paper, we discuss the requirements for repli- cation studies of spatio-temporal visualization systems. These re- quirements are often impossible to achieve for highly contextual visualizations such as spatio-temporal visualizations. We argue that reproducibility—allowing other researchers to validate your findings from your data—is a better aim for highly contextual visualiza- tions. We provide a sample workflow to ensure reproducibility for spatio-temporal visualization and discuss its implications. The use of recommendation systems is widespread in online com- merce. Depending on the algorithm that is used in the recommender system diferent types of data are recorded from user interactions. Typically, better recommendations are achieved when more detailed data about the user and product is available. However, users are often unaware of what data is stored and how it is used in recommendation. In a survey study with 197 participants we introduced diferent recommendation techniques (collaborative filtering, content-based recommendation, trust-based and social recommendation) to the users and asked participants to rate what type of algorithm should be used for what type of product category (books, mobile phones, contraceptives). We found diferent patterns of preferences for diferent product categories. The more sensitive the product the higher the preference for content-based iltering approaches that could work without storing personal data. Trust- based and social approaches utilizing data from social media were generally rejected. Cybersickness poses a crucial threat to applications in the domain of Virtual Reality. Yet, its predictors are insufficiently explored when redirection techniques are applied. Those techniques let users explore large virtual spaces by natural walking in a smaller tracked space. This is achieved by unnoticeably manipulating the user’s virtual walking trajectory. Unfortunately, this also makes the application more prone to cause Cybersickness. We conducted a user study with a semi-structured interview to get quantitative and qualitative insights into this domain. Results show that Cybersickness arises, but also eases ten minutes after the exposure. Quantitative results indicate that a tolerance towards Cybersickness might be related to self-efficacy constructs and therefore learnable or trainable, while qualitative results indicate that users’ endurance of Cybersickness is dependent on symptom factors such as intensity and duration, as well as factors of usage context and motivation. The role of Cybersickness in Virtual Reality environments is discussed in terms of the applicability of redirected walking techniques. We investigate priming and anchoring effects on perceptual tasks in visualization. Priming or anchoring effects depict the phenomena that a stimulus might influence subsequent human judgments on a perceptual level, or on a cognitive level by providing a frame of reference. Using visual class separability in scatterplots as an example task, we performed a set of five studies to investigate the potential existence of priming and anchoring effects. Our findings show that—under certain circumstances—such effects indeed exist. In other words, humans judge class separability of the same scatterplot differently depending on the scatterplot(s) they have seen before. These findings inform future work on better understanding and more accurately modeling human perception of visual patterns. In this position paper, we propose and discuss a lightweight frame- work to help organize research questions that arise around biases in visualization and visual analysis. We contrast our framework against cognitive bias codex by Buster Benson. The framework is inspired by Norman’s Human Action Cycle  and classifies biases into three levels: perceptual biases, action biases, and social biases. For each of the levels of cognitive processing, we discuss examples of biases from the cognitive science literature, and speculate how they might also be important to the area of visualization. In addition, we put forward a methodological discussion on how biases might be studied on all three levels, and which pitfalls and threats to validity exist. We hope that the framework will help spark new ideas and discussions on how to proceed studying the important topic of biases in visualization. Anne Kathrin Schaar, André Calero Valdez, Tatjana Hamann, Martina Ziefle (2019). Industry 4.0 and its future staff. Matching millennials perceptions of a perfect job with the requirements of digitalization.. In: International Conference on Competitive Manufacturing. Sarah Müller-Abdelrazeq, Philipp Brauner, André Calero Valdez, Ulrich Jansen, et al. (2018). Interdisciplinary Cooperation Management in Research Clusters: A Review of Twelve Years. In: ICICKM 2018 (South Africa). André Calero Valdez, Anne Kathrin Schaar, Julian Romeo Hildebrandt, Martina Ziefle (2018). Requirements for Reproducibility of Research in Situational and Spatio-Temporal Visualization. Beliv Workshop 2018 held at IEEE VIS 2018. André Calero Valdez, Martina Ziefle, Michael Sedlmair (2018). Studying Biases in Visualization Research: Framework and Methods. In: Cognitive Biases in Visualizations, Springer, Cham, pp. 13–27. During this years “Wissenschaftsnacht” our research group presented our research to the open public. The room was packed although we were schedulded at 11:15 P.M.
You can see the talk in the following youtube clip. This winter semester I am starting a new course on empirical methods in social sciences. The whole course will be based on using the R ecosystem. Students will learn R using RStudio and have access to a dedicated course room at datacamp. In addition, I’m developing shiny applications that will allow students to “play” with the data. All slides are generated using xaringan and the coursebook is being developed using bookdown. Funded by the RWTH digitization of teaching fund. Funded by the BMBF. I have worked in this project from 2012 to 2015. Funded by the DFG and ther German Federal and State Governments. Between 2012-2017, I have worked in this project in the excellence-cluster. Teaching information will be added soon. A list of all courses can be found here.